Back at the work grind again! *Picks up fourth cup of coffee. I spent the weekend dog-sitting a cute Wheaton Terrier named Archie (more over on my Snapchat: remixher). It was almost like renting a dog for the weekend; kudos to those of you who have dogs—they’re a lot of work (but also a lot of fun)! With my recent haircut, most of my red-tinted hair was chopped off. I love having red hair, but with pool season upon us, it’s harder to keep dyed hair free from chlorine. I’m keeping my hair my natural hair color this summer, which means my go-to Anastasia brow products won’t work (all in the color Auburn). 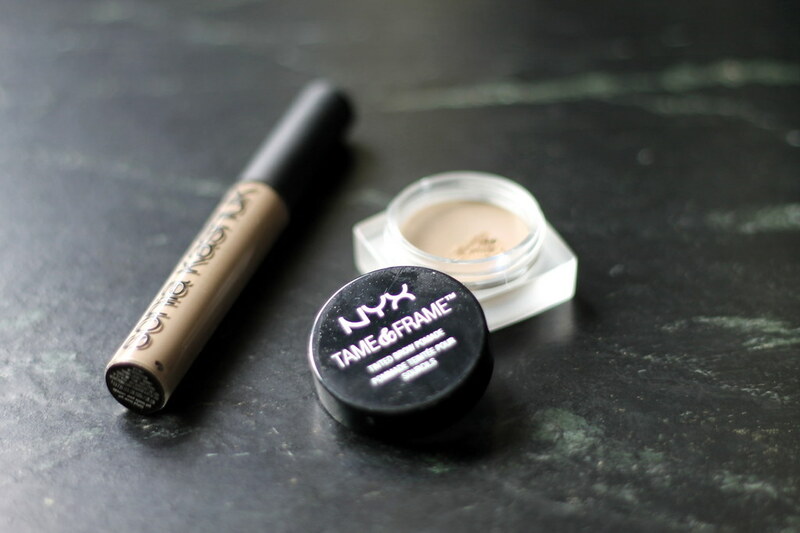 I wanted to updated my brow products for my natural hair color, so I stopped by Ulta last week to pick up the NYX Tame & Frame Tinted Brow Pomade in the shade blonde—which works surprisingly well on me. It might be a hair or two too light, so I darken things up ever so slightly and lock them into place with Sonia Kashuk’s Tinted Brow Gel. Doing my brows has very quickly become my favorite part of my makeup routine lately.